Keeping your legs supported and healthy while leaving your feet pretty and free, those footless Elle Milk Compression Calf Sleeves are 18-22mm Hg, British Standard Class II leg wear with the added benefit of being woven from a milk fibre mix, which uses actual drinking milk protein to produce Latani milk fibre, tiny strands infused with milk’s natural amino acids. This makes Elle Milk Compression Calf Sleeves especially skin kind, moisturising, sanitising and anti-microbial while also being breathable and fast to wick away unwanted moisture. 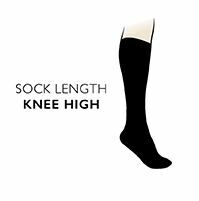 Soft, stay-put comfort cuffs at both ends of the sleeves give gentle hold without constriction, allowing the graduated compression of Elle Milk Compression Calf Sleeves to do its work, energising and supporting your legs through work and play, all day.